Vic Atiyeh, a man to remember and emulate. But luck was with us that day, and calamity did not ensue. The anecdote came back to me this morning when I read the Oregonian’s story about Oregon’s “last Republican governor,” who died Sunday night in a Portland hospital at the age of 91. 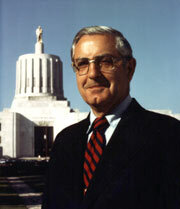 After many years in the Oregon House and Senate, Atiyeh served as governor for two terms starting in 1979. The early 1980s were a tough time in Oregon because a sharp drop in housing nationwide — not environmental restrictions as one news story mistakenly claimed — threw the wood-products industry into a depression. Atiyeh handled it as well as anyone could have. His calm and practical approach to governing served all of us well, even though measures like a temporary income tax surcharge, proposed by Atiyeh and enacted by the legislature, generated lots of grumbling. I remember Atiyeh mainly as a governor who was in close and constant touch with the people of Oregon. The Oregonian story reminded me that he met with reporters weekly. He would also hold regular open houses for the general public in his office, and he showed up in towns around the state all the time. Now and then, as when the repeal of Oregon’s unitary tax was pending, Denny Miles, Atiyeh’s press man, would call newspaper editors: “If you have a minute, the governor would like to explain something to you,” he would say, or words to that effect. And then Vic would get on the line and tell you what he was proposing and why.